Double tap the Space bar in order to end a sentence and begin a new sentence. Double tap the Shift key in order to lock the caps lock. Tap once to unlock. Tap on the “. ?123” key, hold, and drag to the desired character or numeral and release in order to enter the character or numeral and return to the alphabetic keyboard. Tap and hold a letter on the keyboard to enable accented versions of that letter. Tapping and holding on text brings up common options. Tap select to select a word. Use left/right arrow keys to extend options, including bold/italics/underline as well as define to get a definition. In Safari, if you know the domain of the web site you are trying to navigate to, you can type that in, such as “yahoo” or “wikipedia” or “smalldog” without the “www” or “.com” and you should find that Safari will get you there. When you are looking at a website, an email inbox list, or a long mail message, tap the status bar where the time is displayed and you will jump back to the top of the list. It is rare we post these kind of non Mac events into our blog – and to our members – but this one is too good not to. Brought to you by Maui Brainstormers (a group you should think about signing up for anyway), this is a FREE workshop for Business Owners, Managers, Web Professionals and Marketing Consultants! Date : The workshop is set to run on August 30, 2012. Parking – FREE attendance to the seminar includes complimentary self-parking for all workshop attendees. Guest presenter is Adam Broadway of Adobe Systems. Adobe is donating Adam’s time and expertise to Maui Business Brainstormers specifically for this event. Seats are limited. If the RSVP places are maxed, you may choose to RSVP for the waiting list. Click through to learn more and sign up. But don’t be slow – it’s already at 60% capacity. Mahalo to Dan O’Brien from 808shells.com for presenting his cool new iPhone 4/4S case products at our February meeting. Just a reminder, until March 14, you can get one of these cool locally designed cases for $10 off. email info@mauimac.org for your special discount code. Thanks to those of you that came on Wednesday and your attention. As promised, I have posted the presentation to our site. At the same time – I have added a new section – called ‘Presentations’ – where we will add future presentations for posterity. Engineering Apps for iPad – it really is extraordinary what this ‘book reader’ can do !! A weekly column from the mice of Lynn Wegley and Fred Showker. Lynn is a UGN veteran (AOL User Groups Forum) and User Group Network. He’s been a supporter and volunteer on many, many UGNet and User Group Academy projects. 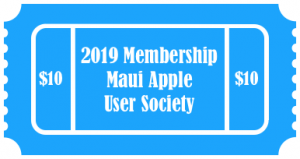 As a long time user group member, he’s been a volunteer from Honolulu to Boston and beyond. Fred has been user group guy since 1986, through the AOL UG Forum days, then out onto the web. for the links and heads up. Follow the link to learn about this new app available in the iPhone App Store.